Jason and I got there around 10:30 and were told that the gym was closed until further notice. Um. What? I really and truly almost had a total breakdown. I can't run, our gym room at the house is pulled apart for repairs to the room. I had no other options. Needless to say, I'm kind of freaking out a bit in regards to how to get in workouts over the next week. Jason was being rational, thank goodness one of us is. He isn't a member at the gym where he takes his master's swim class, but thought maybe we should go over there and just see if we could get a day pass. Good news! They let us both in and didn't even charge us. Talk about a big win for the day. The gym is much bigger than the one we go to. They have pools, tennis courts, racquet ball courts. The locker rooms are flipping amazing with saunas, whirlpools you name it. They have tons of cardio equipment to choose from. The downfall is that the free weight area is rather small (smaller than my gym even which is sad) and there is not really any space for doing something like kettlebells and HIIT workouts (which is what I was going to do). I was trying to refocus myself after the upheaval. I started with about 40 minutes on an elliptical-like machine. It was a lot easier on my heel whatever the thing was. 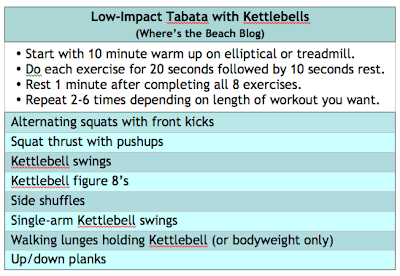 I hadn't planned on being on there so long, I just wasn't sure if I was going to be able to do my tabata workout actually. The whole time I was trying scout out a space to do my tabata workout. I was determined to do what I had planned for the day. 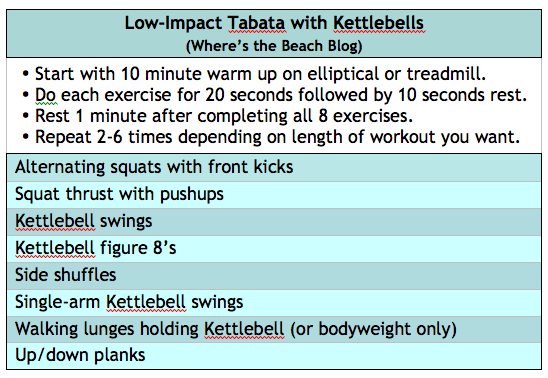 I found a little area and grabbed a kettlebell and get to business with the following plan. I did 5 rounds for a total of 25 minutes. This turned out to be a great workout in the end. And now I'm thinking we might have a new gym to get used to as well. So, I must ask, what would you do if you went to your gym and they were suddenly shut down? After the gym we had to make a stop by Target before heading home. I rolled out and stretched for a while before going to get cleaned up. I thought we were done being out for the day so jammies went one. Jason, however, was wanting to go out for lunch. I think it was mostly so he could watch the Razorbacks basketball game. The restaurant we frequent recently changed there menu a little bit, so he was also wanting to try something new. And it didn't hurt that they had the game on of course. After lunch it was back to the house (and jammies for me) and on to the housework. While Jason was working on scraping down the ceiling in the gym room and prepping the walls (patching cracks), I was busy downstairs. I started some bread, washed laundry, changed out door knobs and pulls on the kitchen cabinets, organized a back room (aka threw out junk) and packed lots of books up to be stored in the attic. Of course I had hoped to get a lot more accomplished, I always do. But it was a nice mix of productive and enjoyment for the day I do believe.